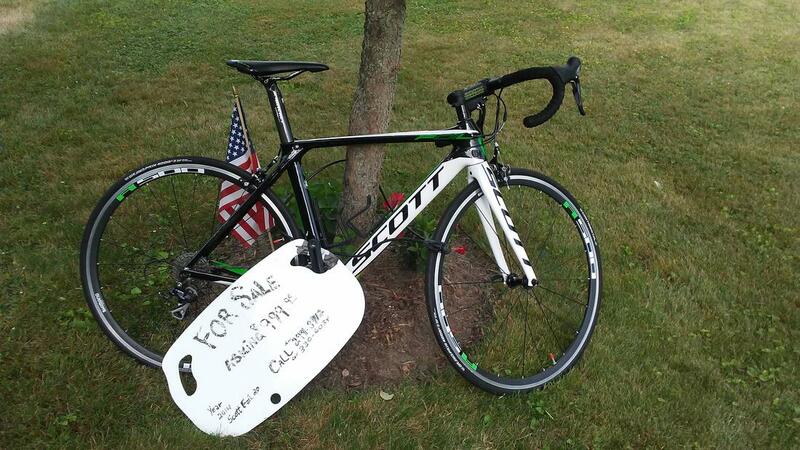 Happened to bike past a house with a Scott Foil 20 for sale in the yard about three weeks ago. I rode past yesterday and saw it was still for sale. Seller is looking for $1000 but is negotiable. Frame is 52 cm... perfect size for me. I believe the asking price is reasonable if the bike is in excellent condition, as indicated on Bicycle Blue Book. Frame looked in great condition to me (pictures attached). Wasn't really looking for another bike but this may be a good deal. This model is more oriented towards racing.. which I don't plan on partaking in. I mostly ride group rides and am interested in endurance riding, so this may not be the best option for that. I'm also a climber based on my body type so having a lighter bike will help. Still... this is an aero bike, not necessarily focused on lightweight qualities. Current bike is a 2011 Jamis Ventura Race which I am very happy with. Would appreciate any comments/suggestions from those who have owned a Foil or been in a bike buying situation. Last edited by Fireyafterburner; 07-07-2018 at 12:42 PM. Aw no one replied? Wish I woulda seen this back when u posted this! The frame is brilliant, the wheels are meh (and heavy), and so are the brakes. It's not a top level build on components but you are buying a great frame. Yes it is stiff. I used to think it rode bad, but riding it recently a lot, even over chip n seal, i'm like meh this is fine, on broken crappy pavement a lot may want something else. Yes it is very capable at telling you exactly what the surface that you are riding on is like...but you can tone that down with peripherals. It's stiff, handles sharply, and puts ALL the power down to the ground. It's based on an Addict, but more Aero while minimizing the trade offs. Yes the Addict could be lighter, but that Foil is very close behind. I wouldn't worry THAT MUCH about weight. And if you are in an area where wind plays a major factor, more than hills (like in northern Indiana), then Foil for sure. I'm not sure why you would run an Addict here over Foil other than the Addict frame has a better tone and feel over bumps... Talking about the 1st gen Foil here (in the photo you posted), 2nd gen is a whole dif story. For long distance (50-100 miles) I find the 1st gen Foil frame fine. Getting it more comfy comes down to good saddle, bars, tape, and tires. Saddle should be the first thing to go. I did a back to back between full stock Foil and mine with Charge Spoon. The Spoon rides and absorbs hella better, cheap and brilliant and why it's on 4 of my bikes. I run 80-85 psi up front to smooth it out, 100 in back cuz the saddle is so good. With better bars (which i've never messed with) it could probably be even better. I have a 2012 Foil Team with Rival and Vuelta Corsa-Lite wheels which are actually brilliant. Just saw your response. Never ended up buying the foil, but did get to ride it a little. Rode well, but wasn't sure if an aero frame is really what I want. The asking price actually went down from $1000 to $850 last time I saw it. For the time being, I'm going to stick with my Jamis Ventura until I know exactly what I want. But I still have my eye on Scott frames, they look great. I might get an addict in the future, we'll see. 2013 Scott Foil 20 or 2014 Felt F4?